Decor Planet, online at decorplanet.com, is the destination for luxury home decor, fixtures, and more. Decor Planet carries bathroom vanities, shower equipment, tubs, toilets, sinks, faucets, storage, mirrors, interior doors, lighting, fans, hardware, and more. Decor Planet also carries top brands such as Grohe, Fresca, Brondell, and more. Before shopping at Decor Planet, be sure to stop by RetailSteal.com for the latest Decor Planet coupon codes, Decor Planet discount codes, and Decor Planet promo codes. 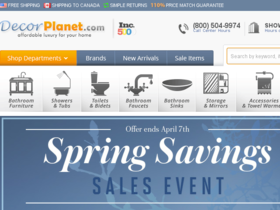 Decor Planet also offers shipping promos that change often. Visit RetailSteal.com for the latest Decor Planet shipping specials. Use code at Decor Planet and save up to 60% on order. Use code at Decor Planet and save 10% on order. Use code at Decor Planet and save 15% on Fresca product orders $1000+. Enjoy free shipping on any order at Decor Planet. Save 10% on order at Decor Planet with code. Save 10% with email sign up at Decor Planet.